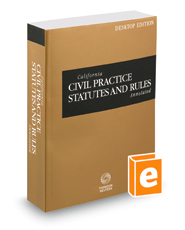 California Civil Practice Statutes and Rules Annotated is the 4-in-1 goldbook containing rules of court relating to civil practice and procedure, as well as research references. This volume includes references to Witkin's Summary of California Law, 10th; Witkin's California Procedure, 5th; and the Rutter California Practice Guides. Marginal tabs and rear cover locator provide easy access to the codes, as well as Law Revision Commission comments, Advisory Committee comments, and Judicial Council comments. Editorial notes provide guidance in the construction and application of particular sections and rules. It also provides a table of relevant California jury instructions.